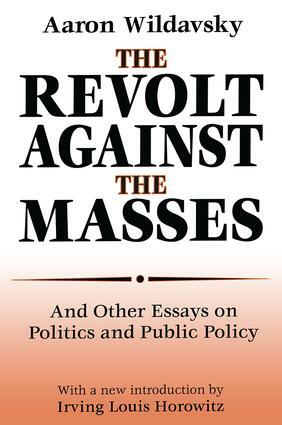 The author of this stunning set of essays on politics and public policy makes crystal clear the meaning of the title. "The revolutionaries of contemporary America do not seek to redistribute privilege from those who have it to those who do not. These radicals wish to arrange a transfer of power from those elites who now exercise it to another elite, namely themselves, who do not. This aspiring elite is of the same race (white), the same class (upper middle and upper), and the same educational background (the best colleges and universities) as those they wish to displace." Wildavsky's bracing work takes a close look at these elites, who probably make up little more than one percent of the population. He sees their common denominator as hostility toward the masses, anti-American attitudes, derision of authority, and a belief in participatory rather than representative politics. The author carries through these themes in a variety of essays on black-white racial relations, social work orientations and black militancy, the politics of budgetary reform, elite and mass trends in the political party system, and the substitution of bureaucratic for democratic modes of advancing the policy process. This work is, in short, vintage Wildavsky: tough minded, spirited, and plain-spoken political analysis. In his new Introduction, Irving Louis Horowitz examines what has changed and what continues to be salient in Wildavsky's line of analysis. Essentially, the report card on The Revolt Against the Masses is that the situation described in these essays has changed somewhat in style but hardly at all in substance. The nuclear shield replaces the ABM treaty, and Afghanistan replaces Vietnam as centers of political gravity-but the same coalition of forces across party and economy still dominate the American political process. The justifiably famous essay on "The Two Presidencies" shows how persistent is the gap between the conflict over domestic priorities and the consensus on foreign policy-and why. This is, in short, a classic text that continues to merit careful study by all those interested in political life. Aaron Wildavsky was, until his death in 1993, professor of political science and public policy at the University of California in Berkeley. He was also director of its Survey Research Center. He served as director of the Russell-Sage Foundation, was a president of the American Political Science Association, and held a number of visiting professorships during his lifetime. Most recently, Transaction has posthumously published Wildavsky's complete essays and papers in five volumes. Irving Louis Horowitz is Hannah Arendt distinguished university professor emeritus at Rutgers, The State University, and longtime friend and associate of Aaron Wildavsky. What Difference Does Reform Make?